this week we have a fantastic old album from "man city lion", chai mueangsing! chai grew up in sing buri province, and like so many others, left for bangkok at a young age. in the city, he studied at a school of agriculture while he could afford it, but eventually dropped out to sing with local ramwong groups and work as a sign painter & market seller in talat phlu. in the early 60s he fell in with mongkhon amatayakun's famous chularat band and made his first recordings. audiences loved chai's odd voice, commanding stage presence and his good looks.. he was popularly known as "the alain delon of thailand"! following a dispute with fellow chularat member phon phirom, chai left the band to front a number of his own combos, playing mostly disco & lounge music under the name "man city lion" (the literal translation of his stage name). eventually he left music altogether and headed home to become a farmer. in the late 80's, however, he returned to the stage to lead a luk thung revival, and today is recognized as a ศิลปินแห่งชาติ (silapin haeng chat) or "national artist" of thailand. 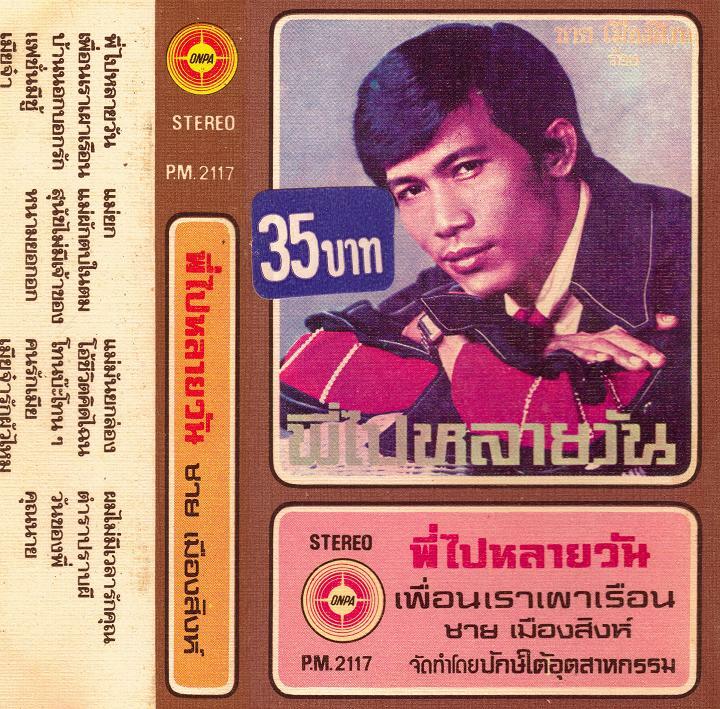 the songs here seem to be quite rare, i've never seen them on any other release.. enjoy some deep luk thung courtesy of chai mueangsing! He's got such a distinctive voice. I love the call and response part with the female (or smurf) singer on the first song. Do you know what kind of instrument is played on track 3, the one that sounds like a repidly played mini-balafon or some sort of wooden (bamboo?) xylophone? Owl Quaeda: thanks, i'll add your blog.. you've been amazingly prolific so far! gojira: yes, i love chai's voice! and yeah, i wonder who that singer is! Many thanks, Peter! I'm enjoying this at work right now. Yeah, really love Chai's voice and the arrangements are wonderfully eclectic (at least compared to the admittedly small sampling of luk thung that I've heard). i agree totally! this album is really great for its variety of styles, and you're right, its not something you'll get with every luk thung album.. i'm glad everyone is liking it!! i don't, in fact, have any of buppha saichon's albums! i will keep a lookout for some around town, though! and to get you started, here's one of her biggest hits, ยมบาลเจ้าขา (yommaban chao ka), written by phaibun butkhan! very interesting blog you've got here. This brilliant record is just another one of those pearls to be found here. oh yeah.. this one of the greatest blogs!!! super nice releases!!! He is still performing today, even though he is in a wheelchair these days. He has had several benefit concerts in the past couple of years, including one at Beer Holland param 2 where no less than 26 other top singers appeared for free. he was also on 7-4 concert this year. He was on the TV show in 1964 when the the term luktung was first used. Can you reupload this please? The link is dead.